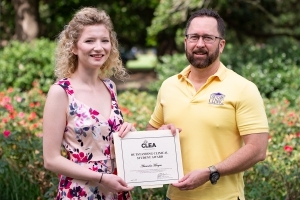 LSU Law Class of 2018 graduate Alexandra Morgan recently was named the recipient of the Clinical Legal Education Association Outstanding Student Award for her work in the Immigration Clinic, Parole Assistance and Reentry Clinic, andJuvenile Defense Clinic. “In addition to her own client work, when other students needed support, Alex quickly volunteered to write the briefs for two additional asylum applications. All of the clients Alex represented won asylum,” said Robert Lancaster, LSU Law professor and director of Clinical Legal Education. In the Parole & Reentry Clinic, Morgan represented two clients who were both serving long sentences for violent crimes. One of her clients was Henry Montgomery, the appellant in Montgomery v. Louisiana, 577 U.S. ___ (2016). Morgan represented Montgomery at his parole hearing. In the Juvenile Defense Clinic, Morgan represented a 14-year-old boy whose case was as complex, and whose charges were as serious, as any child ever represented by a student-attorney in the Clinic. During her representation, Lancaster said. She aggressively developed a plan for his defense, including the filing of a unique defense motion on a complicated discovery issue. Her victory in the trial court on that issue was taken up by the DA on application for emergency writs, and though Morgan quickly responded with an excellent reply brief in less than 24 hours, the First Circuit ultimately ruled against her client. At the same time she was developing the legal defense, Morgan coordinated the development of significant mitigation information through interaction with a community organizer on behalf of her client. “Alex’s efforts greatly benefited the client, who was eventually able to reach a resolution with the State by which he was able to avoid any mandatory commitment to state custody,” Lancaster said. “Thanks to Alex’s work with this client, his family and community support, and her legal work on his behalf, this child is in a far better situation than when he first entered the juvenile court system. Morgan graduated from the LSU Law Center on June 1 with a Juris Doctor and Graduate Diploma in Comparative Law. She was Senior Online Articles Editor for the LSU Journal of Energy Law and Resources and completed more than 100 hours of pro bono service. The nature and extent of the student’s contribution to the clinical community at the student’s law school, if relevant.